Cleft rhinoplasty is the term used for nasal reshaping surgery for fully grown patients with an abnormal nasal appearance due to cleft lip and palate. Babies born with cleft lip and palate have characteristic changes to the shape of their nose. The nasal shape is usually treated surgically during the lip repair as an infant. Some patients also have a “touch up” surgery to balance the tip of the nose again between 5-10 years old. Regardless of the number of nasal surgeries in early childhood the significant nasal growth that occurs during puberty creates an uneven nasal shape. The nasal growth is uneven due to scarring created from the previous surgeries and residual asymmetry in the nasal cartilage, nasal septum and nasal bones. Together these cause abnormal growth of the nose that results in an unnatural appearance. 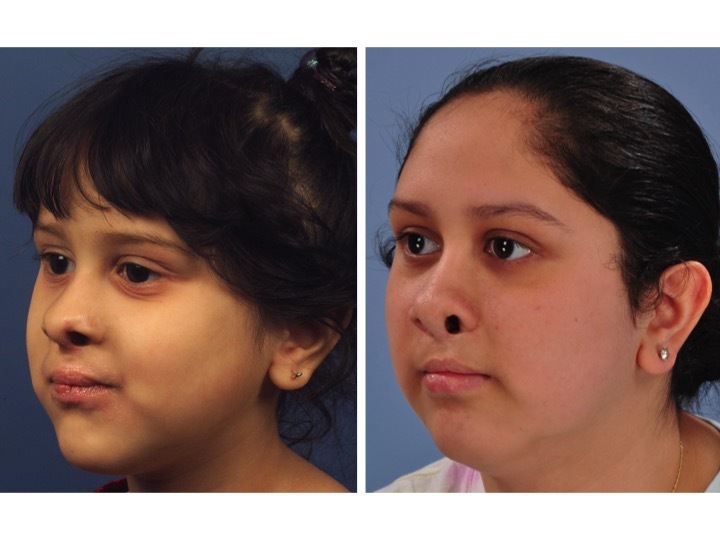 These pictures show how the nasal shape can look good during early childhood, but can worsen with growth due to the scar tissue from previous surgery. Cleft Rhinoplasty is widely considered to be the most difficult rhinoplasty to achieve consistently good results. Having an experienced surgeon is critical to achieve an aesthetically pleasing and natural appearance after cleft rhinoplasty. Dr. Derderian is an expert in cleft rhinoplasty and frequently performs cleft rhinoplasty at his practice in Dallas. 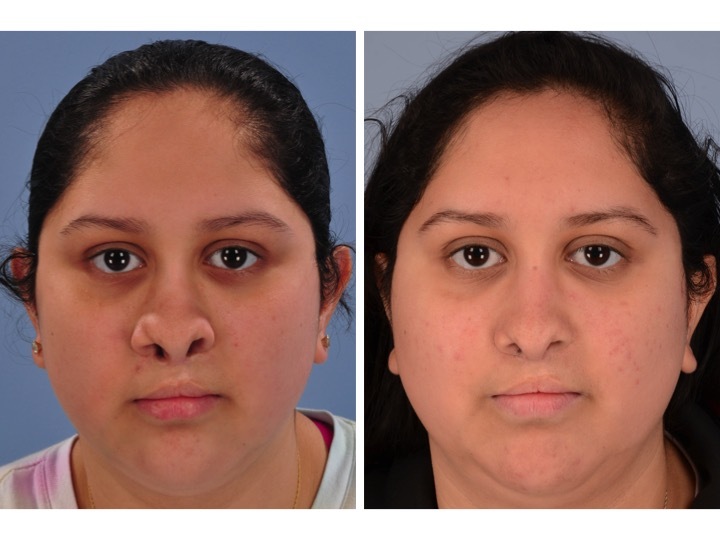 He customizes his approach to each patient based upon their nasal anatomy and goals for change in their appearance. Cleft rhinoplasty is frequently combined with procedures to improve breathing through the nose such as septoplasty for deviated septum and turbinate reduction. Cleft rhinoplasty is far more difficult than typical primary or secondary rhinoplasty for a number of reasons. The anatomy of the nose has never been fully normal and the abnormally shaped skin, cartilage and bones have been altered and scarred by surgery. There is usually less cartilage available for grafts needed to reshape the nose. Perhaps the most challenging factor is that the skin and soft tissues of the nose are scarred which makes reshaping the nose far more difficult than it is in a nose without previous surgery or injury. Am I a good candidate for Cleft Rhinoplasty? It is typically best to wait at least 1 year from the time of the most recent nasal surgery to seek consultation for cleft rhinoplasty. This provides time for swelling to fully resolve and gives the healing process time to complete and allow the skin and soft tissue to soften. The best candidates for cleft rhinoplasty are physically and psychologically healthy, do not smoke and have realistic goals for what can be achieved from surgery. Dr. Derderian uses an open approach to cleft rhinoplasty because the open approach allows direct visualization of the nasal cartilages. Open rhinoplasty requires a small incision in the columella (the skin between the nostrils) through which the skin of the nose is elevated off of the underlying cartilage and bone. This incision typically heals with an imperceivable scar. The duration of surgery varies from patient to patient. Typically the procedure takes 3-4 hours. During surgery the skin is elevated from the underlying cartilage and bone. Depending on the strength and position of the cartilage and bone and the goals of surgery, a variety of maneuvers are used to reshape the nose and improve breathing. Graft material is needed in every cleft rhinoplasty to change the shape of the nose. Cartilage from the nasal septum is the easiest site to get cartilage grafts from, and the nasal septum usually requires straightening during the procedure. A large amount of graft material is needed to reshape the nose in cleft rhinoplasty because the skin and soft tissues are very scarred and stiff. If more cartilage is needed to support the new nasal shape, the cartilage may be harvested from the patient’s ears or ribs. Dr. Derderian frequently uses an alternative source of rib cartilage harvested from donors that has been treated to remove all immune markers that prevents rejection of the graft. Using donor cartilage avoids additional pain and recovery for the patient. After the desired changes in shape are achieved the nose is closed with fine stitches. At the end of surgery soft splints may be placed inside your nose to support the nasal septum. Soft splints are frequently used on the outside of the nose also to help shape the skin. Tapes and a splint are placed over the nasal bridge to support and protect the nose for 7 days. After recovering from anesthesia you will be taken home the same day as surgery by the family or friends who bring you to the hospital. Minimal activity is recommended for the next week. Most patients take a week off from work or school. Oral pain medication is used for 2-3 days. Splints and sutures are removed after 7 days. No vigorous activity is allowed for 3 weeks. After 3 weeks normal cardiovascular exercise and non contact sports may be resumed gradually. No restrictions on activity after 6 weeks. The majority of swelling subsides within a few weeks after surgery, but it takes one year for your new nasal contour to fully refine. During this time, your nose will look normal but you may notice gradual changes in the appearance of your nose as it refines to a more permanent outcome. It is critical to have an experienced surgeon perform your cleft rhinoplasty. During his plastic surgery training Dr. Derderian had extensive training in cleft rhinoplasty at New York University with Dr. Court Cutting, a world-renowned authority in cleft surgery. After completing his residency, Dr. Derderian did a fellowship in craniofacial surgery at the University of Pennsylvania and Children’s Hospital of Philadelphia where he received additional experience performing cleft rhinoplasty. Dr. Derderian is board certified by the American Board of Plastic Surgery and is a member of the Cleft and Craniofacial Team at Children’s Health Dallas. He frequently performs cleft rhinoplasty in both his pediatric and adult practices. He has been invited yearly as an instructor at the world renowned Dallas Rhinoplasty Symposium since arriving in Dallas in 2011.